The Pillow Book is hard to describe. It is an ancient diary, not a novel, so there is not much plot. The entries are undated and although there are references to this or the other festival in this or the other season, it is hard to get a feeling of the flow of time. On the other hand, the little entries tell of a time and place so strange, that whatever moved the writer at her time seems to come from an entirely different universe and sounds like fiction after all. The individual entries talk about the routines of daily court life, interesting outings to festivals, and there is gossip of course, about friends, foes, and lovers alike. The book is very strange, and every time I read it, I feel differently about it. Her stories, although they seem trivial at times – as diary entries are bound to be – still have an eerie way of drawing you in. I don’t know much about the customs of that time, but I wonder what people with a better understanding of them think about The Pillow Book. 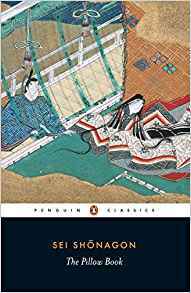 Sei Shonagon (c. 966–1017/1025) was a court lady of the Heian court in Japan at about 970 – 1020. She began writing The Pillow Book when she received a book of fine writing paper as a gift, and her diary ends when the paper was used up. Her little vignettes tell of a time long gone and of strange customs that even at her time only a few people were privy to. Go find out for yourself and get your copy from amazon!